The six Scan4Safety demonstrator sites have completed the audit process at the end of their two-year programmes. Following the publication of the NHS eProcurement Strategy, six NHS trusts were chosen to demonstrate the implementation of GS1 and PEPPOL standards in the NHS. The financial benefits reported by the sites and audited by the Department of Health and Social Care tracked forecast as planned and continue to increase. The release of clinical time to patient care. This is made possible as a result of productivity gains through greater control of inventory and a reduction in administrative processes. When rolled out across the NHS, this extra time released to patient care could equate to as many as an extra 2,400 nurses for the NHS. 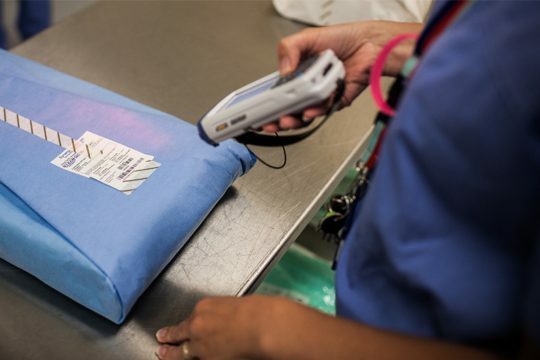 The ability to track and trace faulty products to patients to be able to recall affected patients and products accurately and quickly for corrective action. In the event of an incident such as PIP breast implants or metal-on-metal hips, these trusts are now able to identify and recall implantable medical devices and affected patients in a matter of minutes. Providing a foundation to prevent some clinical errors that result in ‘never events’ in the NHS. Such as the use of the wrong medicine or implant on a patient.